Tours from Gianni's Boat tend to sell out - travelers recommend booking in advance! Swim and sun, relax and fun! 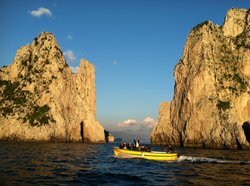 We did a VIP tour which included sailing around the island of Capri with our skipper Paolo. He was awesome! He was extremely friendly, his English was great, he knew everything about the island, it was awesome! We had the most amazing day! We did the four hour tour and it was just enough! Amazing views and the guy that took us guided us through all the grottos with a little history behind them! This is a must do tour!! 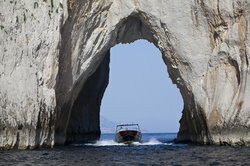 Look no further if you want to do a Capri boat tour. We had an awesome time. I’m super spooked by anything other than uber smooth water and our driver was amazing. Make sure you ask for Pierpaolo, he’s the best and such a delightful and caring person. I'm glad you enjoyed your boat trip with us! 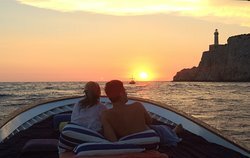 All our skippers are very experienced and do their best to give you a wonderful experience, enjoying all the beautiful sights around Capri island. Thank you, and I hope we see you again in the near future. 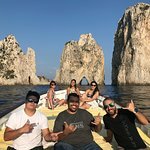 Capri bliss - Thank you Gianni's boats and Lucca for an unforgettable day! 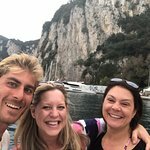 Traveled Oct 2017 for an unforgettable anniversary trip - Gianni's boat went "above and beyond" to agree (offer) to pick us up straight from the dock at Ristorante la Fontelina on Capri when we realized we were going to miss our anticipated swim and lunch at the la Fontelina if we had to hurry back to the other side of the island for our scheduled 1pm pick up ---not-so-easy hike, avoided! Nothing like being whisked away from the dock on a private boat! 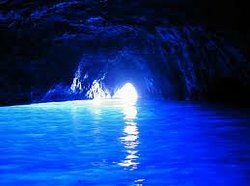 Lucca was a fun captain and tour guide that had us to our first grotto within a few minutes for an exhilarating swim in azure heaven! He was respectful to let us enjoy the moments we wanted to enjoy the sun and silence and sound of the waves lapping our boat together as a couple, but ready to engage in interesting information about all we were seeing when he could sense we wanted to chat. A half day was plenty of time to see all we wanted, we did not feel rushed at all and the personal service and drop off back in Sorrento was worth every penny. It was a perfect day and a highly recommended personal experience we will remember forever! Everything about this tour from the moment I booked (thank you Linda for all of your help) was organized and easy to arrange. We were met by the owner Gianni and his assistant Ana. They walked us to the grozzo where we met our boat Captain Luca. Luca was the most attentive, thoughtful and kind host. He described everything we saw in great detail and the island and it’s caves, grottos, and rock formations were nothing short of spectacular. We were treated to a tasting of homemade limoncello (thank you to Giannis mom) and had a picnic of homemade pasta and eggplant with white wine. Luca made the day incredibly special. I would highly recommend Giannis Boat Tours and hope to visit again someday. Thank you Heather for taking the time to write this glowing review - you are so kind! You were very lucky with the weather - it poured with rain the day after! When the sun is shining Capri is so beautiful, even in October, as you saw. I'm very pleased you enjoyed your time with Luca, finding him informative and pleasant. 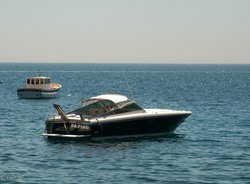 We pride ourselves on having the best skippers in Capri! It is an important ingredient to enjoying the ultimate Capri experience at sea - as is a great shot of home-made Limoncello!! 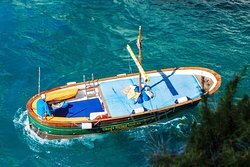 We look forward to seeing you again soon in Capri - and Luca would be delighted to take you out for another amazing boat trip.